Being confined to a wheelchair and using a kitchen can be a daunting task. 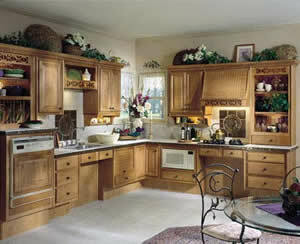 The common designs and layouts of kitchens create all sorts of use problems and obstacles for anyone in a wheelchair. This article provides an overview of the basics of creating an accessible kitchen, as shown in Figure 1. Access to the kitchen is as important as any other design consideration. Door opening should be at least 32 inches of a completely unobstructed opening. The use of swing-free or expandable door hinges , as shown in Figure 2, can help to obtain the minimum 32 inch dimension if you must have a door on the kitchen entry point. Note: Be cautious when using any door thresholds that are raised above the surface of the floor, as these can become a major wheelchair and walker obstacle. With more developers and architects being involved in the design and construction of ADA (American Disabilities Act) compliant homes, many kitchen cabinet manufacturers have created product lines that meet these requirements. Countertop height - should be 32 inches from the top of the finished floor to the top of the countertop. Toe-kick - the toe-kick must have adequate clearance the foot rest of a wheelchair; 9 inches high, 6 inches deep, as shown in Figure 1. 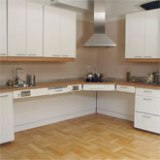 As an alternative a countertop can be used without any base cabinets, as shown in Figure 3, which provides a lot of knee space, but removes valuable storage areas. 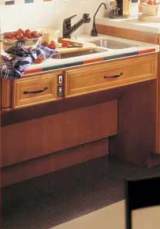 Sink & Cooktop - The sink and cooktop must be mounted in base cabinets that allow the wheelchair to position itself under the units (knee space), as shown in Figures 1 and 4. Sinks - should have rear drainage rather than center drainage, as shown in Figure 5. Rear drainage allows for more knee space under the sink and should still allow the installation of a garbage disposal if desired. Faucets - consider mounting faucets on the side of a sink, rather than the back. Use a single action faucet. Water temperature - being scalded is a safety issue in the kitchen. Mixing valves with water temperature limiting can be preset to prevent scalding. Temperature controlled mixing valves should be set to a maximum temperature of 120 degrees F. or 49 degrees C.
Cabinets - for accessibility base cabinets should have drawers rather than cabinet doors, as shown in Figure 1. The bottom of the lowest drawer should be a minimum of 9 inches from the floor. Drawers - should have high quality drawer slides that allow them to flow freely in and out when accessing them from the side, rather than the front. Drawer pulls and knobs should be of the larger variety. Additional information on drawer pulls and knobs. Countertops - countertops with a rolled front edge can provide more comfort than a countertop with a sharp front edge. Additional information on countertop edges. Height - If installed at the standard of 18 inches above the countertop, only the first shelf will be accessible for someone in a wheelchair. At 12 inches above the countertop two shelves should be accessible. Kitchen wall cabinet lifts, as shown in Figure 6, are available that will lower themselves for easy accessibility. Install flooring that has a hard surface, such as, laminate, hardwood, ceramics or natural stones. Vinyl cushion flooring, carpets, rugs or any other soft flooring should not be used.